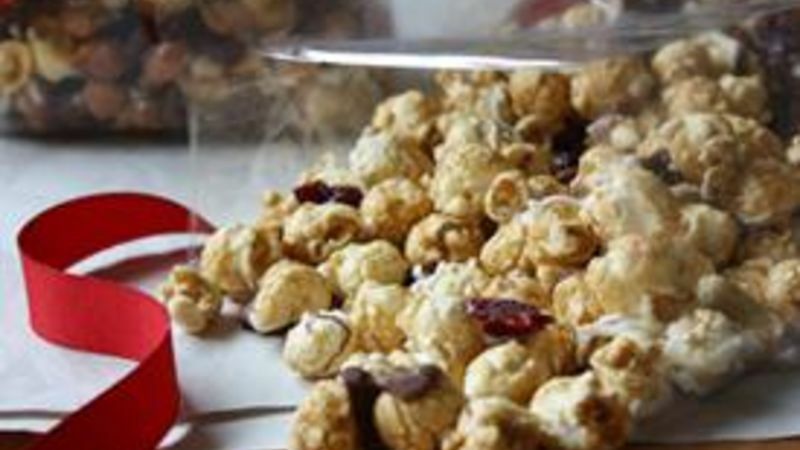 On a parchment paper lined baking sheet, mix together caramel popcorn, cranberries and peanuts. Melt white chocolate chips and milk chocolate chips in separate bowls. Drizzle evenly over popcorn using a spoon. Place baking sheet in refrigerator and cool for 1 hour to harden chocolate. Break apart pieces and scoop into cellophane treat bags. Tie closed with festive ribbon and give as gifts for the holidays! Now that it’s December, I’m in full-on holiday mode. From trimming the tree to baking Christmas cookies to listening to my Christmas hip-hop Pandora station on repeat, I am one holly jolly gal when the holidays are here! Of course, that also means I’m working on a list of gifts to give to loved ones. This year, I’m going with the themes DIY and delicious – and what better way to do so than to make a batch of this Cranberry Caramel Corn Snack Mix? It’s an amazing combination of sweet and salty ingredients, and the best part is it takes about an hour to make and gift-wrap. The formula is simple: A few cups of caramel popcorn + sweet and tart dried cranberries + honey roasted peanuts + a generous drizzle of chocolate = Unbelievable scrumptiousness. It’s not too sugary but not too salty either, and is also perfect for guests to snack on at a holiday party. The bright red color of cranberries combined with white and dark chocolate chips also add some festivity to the mix. While I like to gift my caramel corn mix in cellophane treat bags tied with ribbon, there are plenty of ways to package this gift. On the plus side, it’s sturdy and nonperishable enough to be sent through the mail to faraway loved ones; on the minus side, it’ll be hard giving this addicting snack mix away. Good thing the ingredients are cheap and easy to find, so you can make multiple batches and share some with yourself. After all, if Santa gets milk and cookies, don’t you deserve a little treat, too?